Figure 1-8. Velocities in a Blow back Gun. ante of the driving spring can be ignored completely. while the powder gas pressures are high and are exerting a force of many thousands of pounds on the bolt. The driving spring, in order to permit the bolt to open enough to allow feeding, must offer a relatively low resistance. Although this resistance is sufficient to absorb the bolt energy over the comparatively great distance through which the bolt moves in recoil, it is not great enough to offer significant opposition lo the powder gas pressure until the chamber pressure has dropped to a relatively low level well after the projectile has left the muzzle. It has often been remarked that a plain blow-back machine gun could be built to fire high-powered 20-mm ammunition providing that there was no objection to the exccssivc weight necessary in the bolt or to the inherent low rate of fire. The fact of the matter is that such a gnn would be entirely impractical for other more cogent reasons. For example, if it is assumed that the initial velocity of the 500-pound bolt mass is about 2.50 feet per second, the energy imparted to the bolt will be only about 50 foot-pounds. Since this energy is sup plied to the gun mechanism only 50 times per minute, or at the rate of 2500 foot-pounds per minute, only 8/100 horsepower will be available for doing the work necessary for feeding, firing, ejecting, overcoming friction, and for performing the other functions required of the gun mechanisms. This seems hardly sufficient power to operate a machine in the class of the breech mcchanism of a conventional 20-mm gun. In other words, the heavier the bolt, the less energy it will absorb from the pro-pellant explosion and if the bolt is too heavy, the gun may fail to function automatically because insufficient power will be available to operate the mechanism. for a 500-pound bolt and it is also doubtful whether it could exert enough direct force to operate the feed mechanism or to perform other tasks requiring a fairly powerful thrust. Another serious shortcoming of such a spring would become obvious by the embarrassing way in which the bolt would slide, open whenever the gun is elevated a little above the horizontal. 1. To prevent case separation or rupture of the case near its base, the bolt, velocity must be limited to an extremely low value. 2. 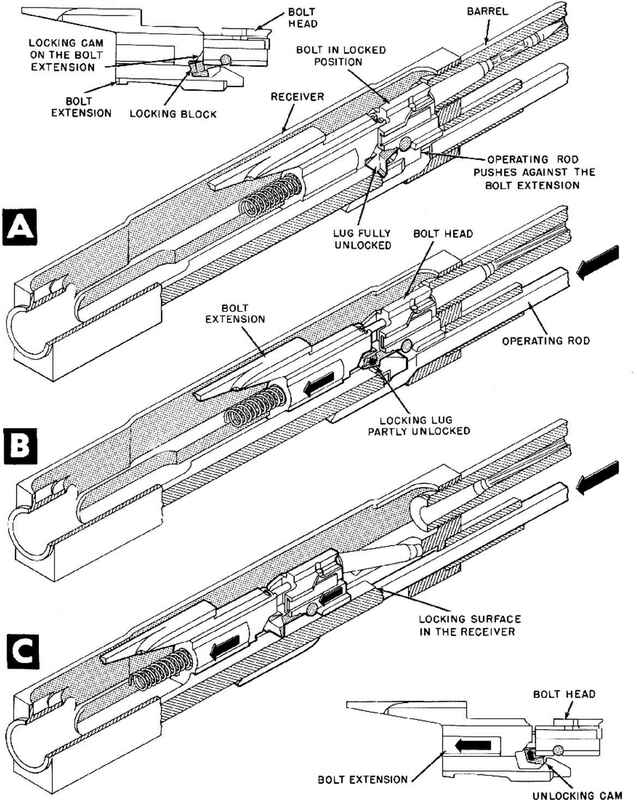 For this system, lubrication of the ammunition does not permit a significantly higher bolt velocity. 3. In order to limit the bolt velocity as required, the weight of the bolt must be excessively great. 4. Because of the nccessitv for low bolt velocity, the rate of fire is too low for any practical purpose. 5. The driving spring is not a significant factor in limiting bolt velocity. 6. The bolt of a blowback gun is the means whereby energy for operating the mcchanism is obtained from the propellant explosion. Because of the excessive bolt mass required in a plain blowback gun. and the low rate of fire, insufficient power is obtained for maintaining automatic operation. 7. The driving spring is of necessity very weak and can not exert sufficient direct force to perform its function satisfactorily. All of these points demonstrate amply why no succcssful plain blowback machine gun has ever been developed to fire high-powered ammunition. The following paragraphs describe a systematic procedure for performing the computations necessary in a basic analysis of a plain blowback gun. For the most part, the methods described are conventional and follow the lines of analysis which have been used for some time in general engineering studies of guns, particularly artillery weapons. The main endeavor in this present analysis was to reorganize the existing methods and to modify and supplement them as necessary to adapt them for convenient application to the specific problems encountered in the design of blowback machine guns. It must be emphasized at the outset that the principal concern of this analysis is to establish a method which may be used to determine the bolt mass required to limit the bolt recoil velocity to a safe value and, on the basis of this mass, to make preliminary calculations for determining the driving spring design data, rate of fire, bolt motion characteristics, and other useful information. In this analysis, no attempt will be made to discuss the straightforward machine design methods by which the results are applied in arriving at the particular physical form of a breech mcchanism. Also, no detailed computations are made to cover the effects of such factors as friction or the incidental forces imposed on the breech mechanism by the auxiliary mechanism such as the feeder, firing device, or cjcctor. These, effects are entirely negligible in determining the bolt mass, but they will have some influence on the overall bolt motion and rate of fire. In any case, they can be properly taken into account only in the more or less advanced stages of a design when the form of the gun mechanism becomes fairly well established. At this point, the preliminary values determined can easily be modified as required. Figure 1-9. 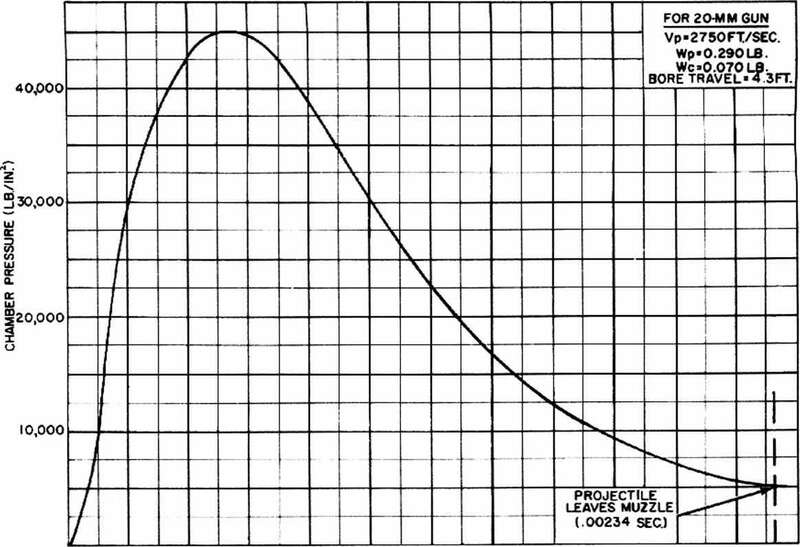 Graph of Chamber Pressure Versus Time (20 mm Gun). velocity and barrel length have been predetermined. It is also assumed that all necessary' interior ballistics data are known and that graphs showing the time variation of projectile velocity and chamber pressure are available (figs 1-9, 1-10, and 1-11). NOTE: For some design problems, all or part of this information may not be available. Analytical methods by which the required data and graphs can be approximated for use in preliminary studies may be determined by conventional interior ballistics computations. 1. Determination of the bolt weight required to limit the recoil velocity to a safe value. 2. Determination of the data necessary for designing a driving spring which will permit the bolt to open the required distance for feeding. 3. Computation of the rate of fire. 4. Development of graphs showing how bolt velocity and bolt travel van- with time. 5. Computation of power absorbed by the bolt. a. Momentum relation for time projectile is in bore. d. Formula for determining initial bolt energy, c. Formulas for determining spring retardation.